Build a powerful yet efficient gaming rig with this 32GB Corsair VENGEANCE memory kit. Its XMP 2.0 support for automatic overclocking on its two 16GB DDR4 modules lets it keep up with intense multitasking demands while operating with low-voltage output. 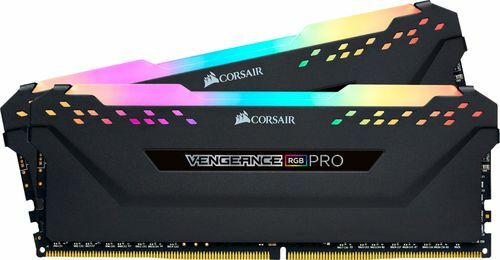 The anodized aluminum heat spreader on this 3000MHz Corsair VENGEANCE LPX memory kit keeps its cool. FeaturesKit of two 16GB DDR4 SDRAM memory modules For 32GB total memory. Up to 3000MHz operating speed For excellent multitasking capability. 8 Layers PCB heatspreader Keeps memory cool for efficient operation. 288-pin DIMM Enables capable system operation. DIMM is dual in-line memory module. 15-17-17-35 latency For efficient system operation.